The Bhagavad Gita, a verse poem divided into 18 books, composed about 200 BCE, is considered a monument of the human heart and spirit, testifying to man’s quest for truth and wisdom. For more than two thousand years the classic Kuruksetran text, subsumed into India’s national epic the Mahabharta, has been considered far and near as the ultimate instruction manual for living a spiritual life. In modern life the insights of the Bhagavad Gita continue to confront the problems of the 21st century, speaking to issues such as choice, duty, and purpose. Many great men have extolled its virtues. “When doubts haunt me, when disappointments stare me in the face, and I see not one ray of hope on the horizon, I turn to the Bhagavad Gita and find a verse to comfort me,” said Mahatma Gandhi. “When I read the Bhagavad Gita and reflect about how God created this universe everything else seems so superfluous,” said Albert Einstein. “It’s about the game of awakening, about the coming into Spirit,” said Ram Dass, the author of Path to God: Living the Bhagavad Gita. In the world of yoga the Bhagavad Gita is both seminal and revelatory, because it is through Arjuna’s questions and Krishna’s answers that the underpinnings and practice of yoga are revealed. Although yoga has much to do with physical and mental well being, in the Bhagavad Gita the original spiritual purpose of yoga, connecting one’s consciousness to the supreme consciousness, is the nexus of the poem. Everything else is coincident to controlling one’s body, mind, and senses for the purpose of uniting with the divine. The Bhagavad Gita is not without its problems, however, among them its Homeric sub-text, its wild inconsistencies regarding non-attachment, and its top-down rationale for ordering human affairs. One of the most vexing problems is how to take Krishna. Is he the avatar of yoga’s most abiding and sublime motifs, such as vairagya and ahimsa? Vairagya, or non-attachment, and ahimsa, or non-violence, are two of the basic precepts present in nearly all forms of yogic thought. Or is he a monster who advocates war for his own unspeakable reasons, justifying fratricidal conflict with specious arguments about the meaninglessness of physical existence? The question and problem come to a boil in Book 11. As Book 10 ends Krishna declares that he is so vast and great that just a single fragment of him is enough to “support the entire universe.“ Despite this declaration, Arjuna says to Krishna that although he doesn’t doubt his godliness, he would still like to see first-hand what it amounts to. Krishna grants Arjuna divine sight for a few minutes so he can transcend his mortal vision and see Krishna for what he really is. What follows in Book 11 are six omniscient narrative stanzas and seventeen stanzas spoken by Arjuna describing what he is seeing. Krishna is described as being everything and everywhere, without beginning or end. At the same time, he is described as sitting on a lotus throne, wearing a crown, and bearing a mace and a discus. Krishna is everything, but at the same time is the King, or Lord. He knows what the truth is, being everywhere and everything, and as the King or Lord, wields the power of that knowledge. Arjuna goes on to describe the angels and demons that gaze at Krishna in amazement, the chants the sages sing to him, and how the “innards” of mortals tremble at the sight of him. Since Krishna is said to have “billion-fanged mouths blazing like the fires of doomsday” no one should be surprised at the bellyful of distress mortal men might feel at the sight of him. The next lines are the crux of the problem. They describe the opposing armies on the battlefield of Kuru, those of the Pandavas, led by the virtuous Arjuna, and those of the Kauravas, led by the one hundred sons of a blind king. They are both being swallowed up indiscriminately by the voracious Krishna, who Arjuna is seeing in the guise of his real godliness. “Rushing headlong into your hideous, gaping, knife-fanged jaws. I see them with skulls crushed, their raw flesh stuck to your teeth,” Arjuna says. It is a godless Gita as Krishna goes about his grisly business. If the Bhagavad Gita is a recruiting poster for Krishna’s promotion of the war, which is his often-stated and explicit intention throughout the poem, the slogan “I Want You” takes on a sinister double meaning. Regardless of what side they stand on, all the warriors on the battlefield of Kuru are grist for the mill. All of Krishna’s reasoning, arguments, and commands are to one purpose, which is to get the detritus of war to pour down the craw of his rapacious mouth. In Greek mythology Kronos, the Titan god of time, devoured his children for fear that they would one day overthrow him. In the movie King Kong the big monkey tried to use Fay Wray as a toothpick. Neither self-survival nor the niceties of gastronomy seem to motivate Krishna. He is the great maw that must be fed and sated, although from all accounts in the Bhagavad Gita it is doubtful that Krishna can ever be sated, given his enormous appetite and preoccupation with the eternal. Krishna does not explain himself other than to say he is death, annihilating all things, the “shatterer of worlds.” He bluntly declares that both armies will perish with or without Arjuna, and echoing Homer again, specifically the Illiad, urges Arjuna to fight and win everlasting glory. It is a harrowing picture. Krishna then blandly advises Arjuna to not be frightened anymore and see him as he was before. When he does, Arjuna is put at ease. It is an extraordinary recovery after seeing the “shatterer of worlds” gobble up thousands of warriors like so many French fries. Krishna explains the merits of living in the now for most of the Bhagavad Gita. At the end of Book 11 he has apparently succeeded. Arjuna says his “mind has regained its composure” and it is on to the next thing. Arjuna has moved forward from one now to the next now without any thought of consequences or repercussions. Every now is now the same as every other now. In Book 1 Arjuna catalogued his many and valid reasons for not going to war, not including ahimsa, which is never mentioned. Be that as it may, Krishna has won the day. 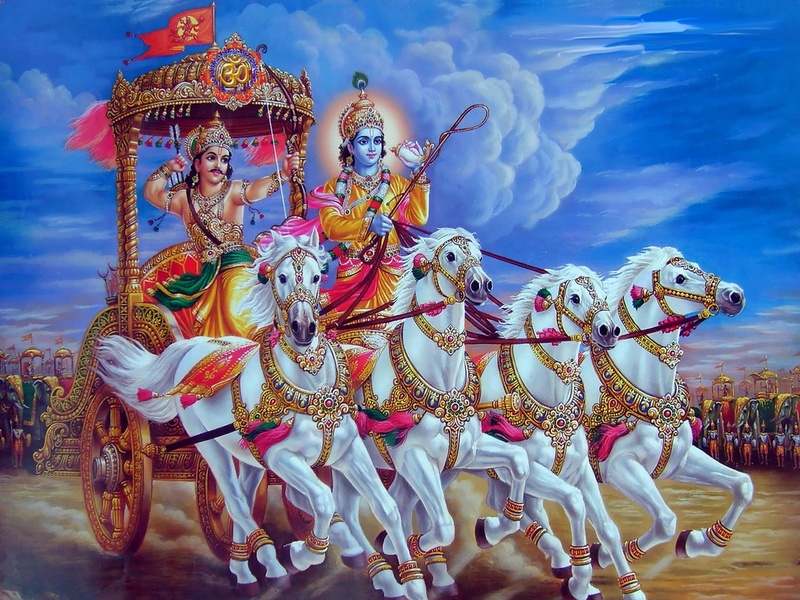 Like a lamb going to slaughter he consents to Krishna driving his chariot back into the god-ordained fray. It is unclear how this decision to go to war on the battlefield of Kuru dovetails with uniting to the divine, the supposed purpose of Krishna’s yoga lessons. The poem ends with the poet Sanjaya, who is reciting the poem, saying that he has seen “splendor and virtue and spiritual wealth.” This may be apt assessment, especially in Books 2 through 8, but it cannot be right when seen in the light of Book 11, in which Krishna reveals his true nature, which is self-serving, evil, and spiritually bankrupt. Practicing nonattachment in order to apprehend the divine, as Krishna advises at the beginning of Book 7, may be the way to go about living the yogic life, but when Krishna adds the epithet that it requires “surrendering yourself to me,” I believe it may be time to speed-dial the nearest dentist for custom-made orthodontic retainers to restrain the “knife-fanged jaws” of the Hindu god.